It’s 4.55am on the 1st December 2018 and I’m stood on the start line waiting for the gun to go on my longest and biggest race to date - the Ultra Trail World Tour 65km in Cape Town. I’m a mixture of so excited I might explode and so terrified I may vomit but I only see that as a good thing really. I’ve trained so hard for this race and I can’t wait to get going. I have no idea what might happen in the next 8 or 9 hours but I’m keen to see how it will unfold. The lead up to the race has involved a lot of preparation; a hell of a lot of running, some heat acclimatisation, travel plans, practising how to eat and run, learning to drink and run as well as mentally preparing for a race hours longer than I’m used to but it’s a fun process. I’ve made the South Downs Way my playground of choice, often dragging my boyfriend, Dan along for hours on end on his MTB but it’s got me through some tough old runs while I worry he might slowly be hating me running easier up the hills than he can (understandably) pedal. As England entered Autumn and Winter months, cold weather started to seep in and I had to get used to running in the heat...hello copious jumpers, bobble hats, buffs and gloves. Sweating profusely in a fairly mild English winter was pretty hard but all I could think was how much easier it’d be in the midday heat coming down Table Mountain having adjusted to warm blood again. 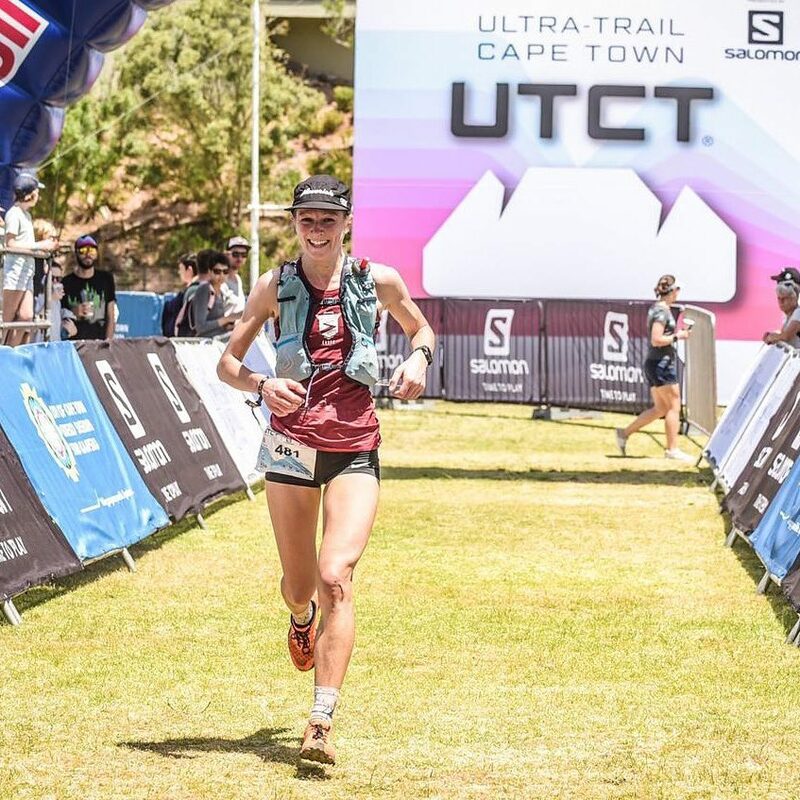 The gun goes at 5am and a sea of heads torches set off through the city towards the first climb, up Signal Hill along the red dirt tracks and around Lion’s Head seeing the sun rise over the sea. What a treat. It took a good few miles to settle in to the race, sharing a few miles with other runners and getting some tips on the course and things to look out for from seasoned veterans to the race. Coming through the first aid station it was time to start the BIG CLIMB up Table Mountain. I’m not going to lie, I’m not very good at researching races before running them and in a way, I like not knowing what to expect. I appreciate in more technical races this is not the way to approach it but for now take it as it comes...so here was Table Mountain. Steps, steps and even bigger steps. I felt like a tiny borrower with huge strides climbing the stairs but I was making some good time, overtaking a fair few runners and progressing well. My legs were starting to scream, but what did I expect - they have very little mountainstrength. Power. On. Through. The ridge line skirting the mountain would have terrifiedme had I hung around but today I was skipping past a few runners and taking in the views as the sun burst for morning. The heat rose and after a slower technical descent I was pleased to see some flat tarmac for a little bit of respite and some fast leg turning if only for a few miles. That should get rid of the mountain legs...surely. I was flying past people for a few miles, switched the long lost road marathon legs on and blasted out a few miles which felt ace. The temperature however, continued to climb as the mid morning sun set in on the lower land. This I knew, were I to panic and start to think too hard about it, the gremlin would win but today my brain just said “hey, you’ve got this. Remember those times you ran with your entire wardrobe on, sweating buckets and you survived” and the anxieties swept away. Thing is, I hadn’t prepared food-wise for warm weather. My training had involved a lot of banana Soreen, chocolate brioche and GU energy gels but today I wanted liquid energy. Never try something new on race day they say, but I’d had the foresight to pack some Maurten which was the hero of the day with some Powerade at each aid station to keep me going. The gamble paid off. The next sections toured the vineyards with a respite from climbing and going in to the 4th aid station where Dan was waiting. It felt like an age since I last saw him a few hours ago and I could barely get a word out, I just didn’t know how to process the race. I was so pleased to see him but it felt like a dream. Seeing his face was amazing but reflecting back, I don’t think I showed anywhere near the level of appreciation I felt for his presence. The next section (again read the race profile Julia) was a pretty technical section through woodland with rolling hills and a lot of tree branches. The shade was amazing but my poor legs were tired and so unused to both the time on feet and the climbing that had already happened. This was the most testing section of the race mentally and physically. It felt like no-mans land where I couldn’t comprehend ever wanting to run this far again but I had an inkling this feeling would pass and some head-down-and-get-it-done attitude would need to be employed. Rolling in to the final aid station at the university felt surreal. It was so noisy and busy but the marshalls were quick to grab my bottles and help me re-fill for one last time before the climb to Blockhouse. This climb felt epic. With 10km to go, my road running head was telling me less than 40 minutes to go but the reality was this was a very steep and very hot climb in the midday sun. I got my head down and made some good head way, over taking a lot of runners on the 23km route and getting the miles done. Curving the lower traverse of Devils Peak, I was counting down those last few miles. I could hear the finish line and I knew I was getting closer. My legs were screaming and my hips were so sore from lack of climbing experience but I expected this and knew I was on the home straight. The last few miles were some of the most beautiful and colourful of the whole race; purples, greens and yellows bursting from the sides of the trails and cheering me home. My heart and soul lifted me all the way to the finish line and that one last lap of the field coming in to the finish felt extraordinary. It was surreal that I had conquered something that at times I didn’t quite believe I could do. I ran those last few metres not knowing whether to laugh or cry and so relieved to see Dan and a beer waiting for me. You learn so much from putting yourself in challenging situations and until you do, you will never grow as a person to know exactly what you, in your skin can do. The pride I felt to have completed something I had doubted several times in the past 8 hours was incredible. All the hard work for the past several months had paid off and most importantly I had absolutely loved it. I loved the hard parts just as much as the easy because it made me feel fully alive. So, the only question left is what’s next?! Final note - One thing we know about Julia is that wherever her running legs take her next this leading lady is bound for big things. She is the fastest lady I have personally ever met, yet she is also the most humble runner. She never speaks of her great achievements of lightening speed. She always asks about others before ever talking about herself. She must train endlessly but she is never too tired to lend a listening ear. It is a complete joy to have Julia on the team and despite her being a few inches shorter than me, she is a lady I look up to. I know she’ll always be waiting for me at the finish line, with those happy legs, a massive grin and a hug. You rock Jules!